I think only another geocacher could understand my excitement when I turned my phone on in a restaurant in the middle of Paris, quickly checked my geocaching app and the lovely sound of the little ding-ling-a-ling telling me I was nearly at a cache was heard. Now what self-respecting geocacher could ignore the temptation to quickly find it – and it was only 29m away from where we were sitting!! Our main problem was that we had decided to visit Paris early last summer (even before we started Geocaching) and had scheduled in a few days sightseeing this January not knowing what a terrible tragedy was to unfurl. 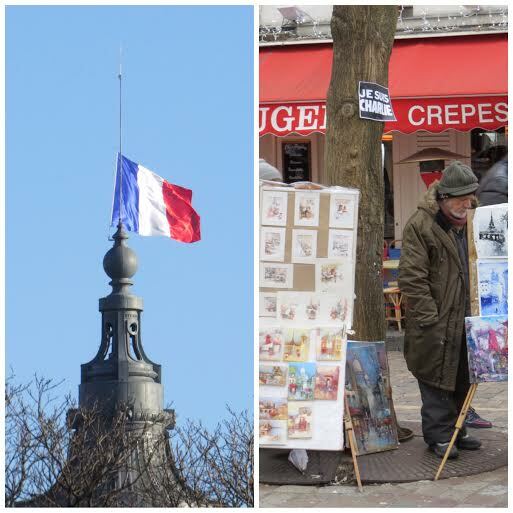 “Je suis Charlie”, and unfortunately our visit coincided with these dreadful happenings. We had only been updated with the current news a few minutes before by the restaurant owner and now it made sense why the restaurant was lacking in customers. Cockrobbinn and I hurriedly left the restaurant and headed towards the cache. We were just off the Champs-Elysees and due to the tragic happenings that very day the roads were quite empty but there were armed police and military everywhere. We spotted where the cache was likely to be hidden – and surreptitiously started working our way along the metal bars on the grill keeping a lookout for any Muggles or worse, any soldiers. To my mind nothing could look more suspicious than a couple of fairly well-dressed ‘senior citizens’ crouching down on a Paris pavement; getting quite dusty to boot and apparently trying to find/hide something in a strange place. Hurrah, I found the container quite quickly but neither Cockrobbinn nor I have ever felt such a strong magnet !!! It took ages of pulling, pushing and plying to get the container out. At last……..we could sign our very first overseas log Les Champs 2 GC5BVZ8. We quickly replaced the container and made our way back to our hotel; very pleased with our first log but very sad for Paris. 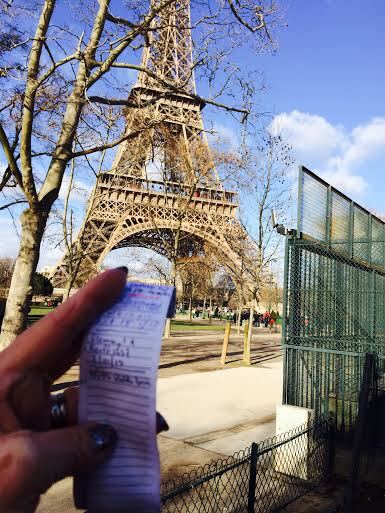 We knew we weren’t going to have very much time for Geocaching whilst in Paris but we were also quite determined to pick up just a very few along the way. As we were staying right by the Champs-Elysees, Les Champs GC5BRW4 seemed a quick one to find, and thankfully it was. A really nice start to a lovely sight-seeing day; an easy find within view of the magnificent Arc de Triomphe. 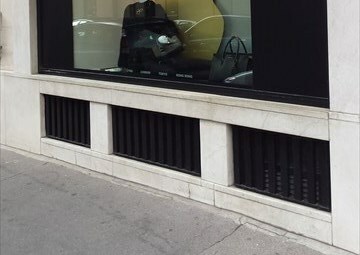 Perhaps this cache is not for all but it will provide you the challenge and the personal satisfaction of having found a cache in the busiest street of Paris and maybe of the world. Your task, if you accept it, is made difficult by an extreme amount of muggles traffic and a sometimes unstable GPS reception. Now you just have to wear the famous invisibility cloak and go out on the discovery route. Enjoy! We did attempt to look for this cache one afternoon; even had a coffee at the pavement café nearby, but the amount of muggles, police and armed military made it almost impossible to feel comfortable having a close look in all those poky corners and crevices so we gave up on this one without really searching very hard. Another day we found we had a spare hour after having the most wonderful cruise on the Seine. We were at the base of the Eiffel Tower which we had thoroughly enjoyed seeing on a previous day although I do have to admit my tummy kept doing somersaults when we were viewing the fantastic panorama of Paris from the second level; no way could I go up to the top. Level 2 was fine for me! I was taking photographs one-handed as felt safer holding on! 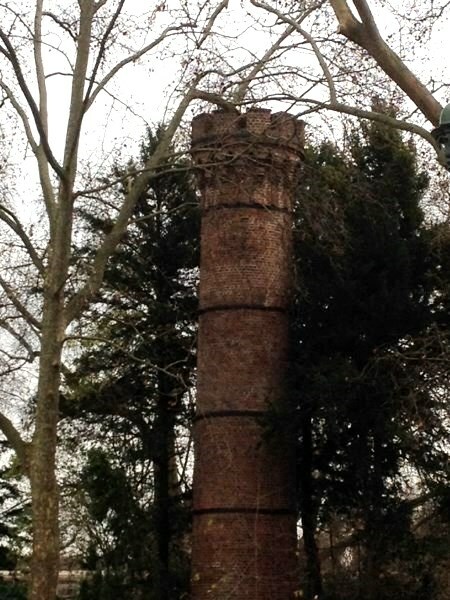 Very close to the Eiffel Tower, around the north-west pillar and deeper into the park is a strange red-bricked chimney (little known even to the Parisians themselves). She is called the Iron Lady and she was built at the beginning of the building of the Eiffel Tower in 1887 as an incinerator to burn all the waste. We headed towards the chimney as a cache was hidden very near to the gate in the fence surrounding it. Les Deux Tours GC555DJ looked to be an easy find but two people had already found the cache just ahead of us and the little warning ding-a-ling from my phone gave us away! It gave us such great pleasure to meet our first French Geocachers going under the name of Locono. We stopped and chatted for a while, none of us very conversant in the others’ language but we managed to exchange names and find out that they were hoping to complete their first 100 logs that day; something that we had done quite recently. Do not take any risk if you do not feel like climbing. It is only one cache and there is plenty of more caches in the area . Seeing it from the ground level is not enough to claim for a find, so you will have to climb, that is the aim and only interest of the game here. Cockrobbinn does like a challenge but seeing that he was dressed in his best black ‘City’ coat and slippery leather shoes, I am quite pleased that he didn’t slip and break a leg. 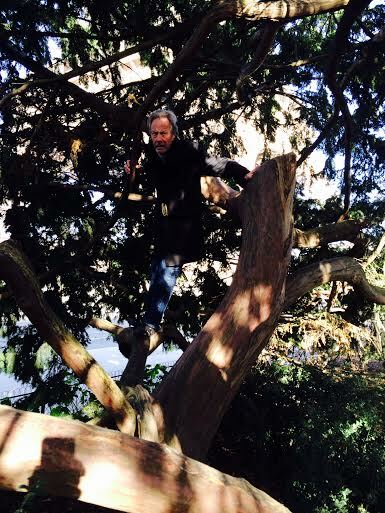 We found the correct tree quite quickly although we had to hop over a little fence and dive through some shrubbery to reach the base – all the time looking out to make sure we were not being watched! I stayed at the bottom whilst Cockrobbinn decided to try and retrieve the cache. But it wasn’t to be…………..he got quite close I think but I was a little nervous to see the armed military approaching so rather nagged him to come on down. We left in such a rush, out through the bushes and brushing ourselves off, that we left our water bottle at the base of the tree. Unfortunately a DNF for this one. 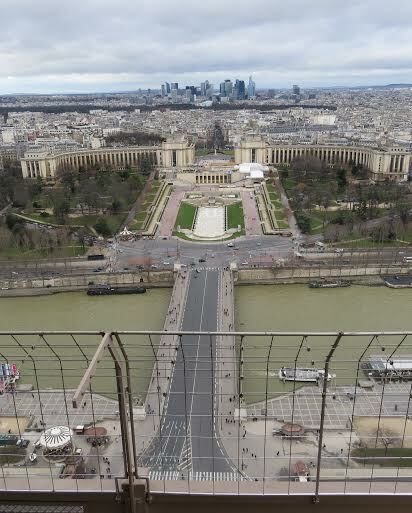 We had time for one more cache at the Eiffel Tower so we zoomed in on Gustave et la Tour GC4HAV3 and soon came across the monument in the memory of Gustave Ferrie who suggested the implementation of an antenna on top of the Eiffel Tower in 1903. The cache was nearby and found exactly where expected although we felt it was a little bit too easy to see. We waited for a couple of Muggles to leave before hiding the cache very carefully. We’d finished for the day – or rather had run out of time. Trouvé le log book au sol. Remis dans une cache de fortune non fermée. A gauche de la porte du monte charge. Although we hid the cache carefully and were sure no Muggles had seen us, we feel that someone had taken the cache out of its hiding place and just left it on the ground. Locono was the Geocacher we had met earlier and we knew he was hoping to find more in the area and whilst we are delighted he reached his ‘100’ finds, sad to see he found this cache in the open. Makes us feel that perhaps we should have been even more careful. Although we had quite a few days in Paris, we only had time to quickly retrieve one more cache and again this was very near our hotel. Early one morning we walked toward the American Cathedral of the Holy Trinity where the cache Les Champs 3 (Georges V) GC5BW08 was hidden and after a little searching soon found it and signed the log. Cockrobbinn and I had a superb stay in Paris; the weather was really kind to us; our hotel was fantastic and so well-situated for all the sites. We did most things that we had planned to do and even managed to find a few caches along the way considering that this trip had been arranged long before we started Geocaching. It is unfortunate not just for us, but for the whole of Paris that the dreadful scenario unfolded whilst we were there. The French people were naturally very nervous but were absolutely defiant in that they would go about their everyday business and they were extremely helpful and welcoming to us. We were advised not to venture too close to the Rue de la République on Sunday 11th but we watched the march on the television in the evening and could hardly believe that about a million and a half people had gone and many stayed until late evening. Every shop, every doorway had the sign ‘Je suis Charlie’ and it was quite a moving sight to see the Tricolour at half-mast. 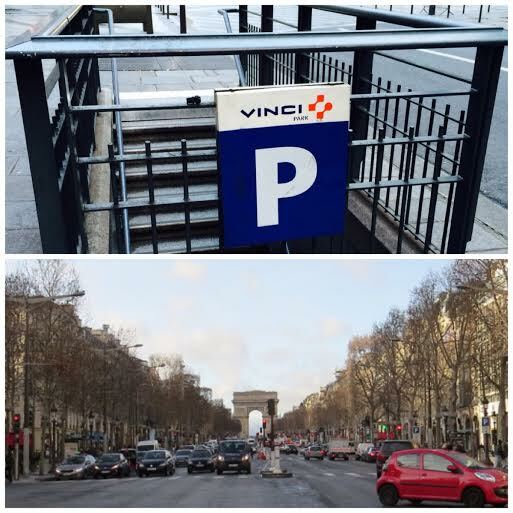 This entry was posted in Caching, Champs-Elysees, Eiffel Tower, France, Geocaching, Paris and tagged Champs-Elysees, Eiffel Tower, France, Geocaching, Paris. Bookmark the permalink. A very entertaining read. It must have been a very intense place to be at times. A Nation scared is an uncomfortable thing. Well done on managing to squeeze in a few smileys. We have not done any outside the UK yet. 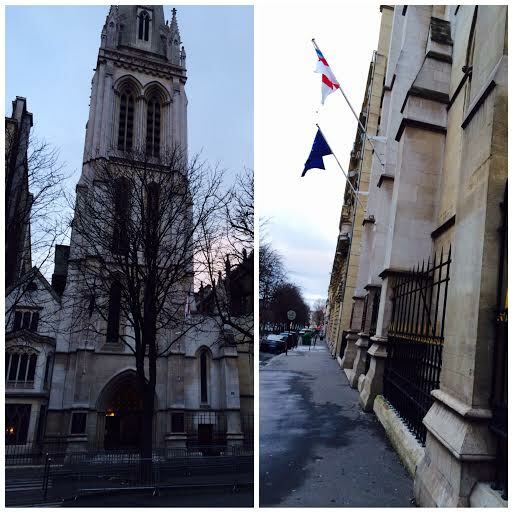 We stayed at Hotel Claridge, rue Francois 1er. Very conveniently situated. The only complaint was very poor Wifi.